Decay, warp, rot—not a list of words you ever want to hear when describing a home exterior. Unfortunately, water can damage your home exterior like nothing else. It may be gradual, but it is relentless, and can lead to mold damage, rotting boards, swelling, cracking, and peeling paint—another list of not-so-appealing words. Instead, your home exterior should feel like armor. Enter James Hardie® siding and trim, made of fiber cement, their unique formulations are engineered to withstand damage from moisture and rot even after years of wet and freezing conditions. Engineered for Midwest Climate. James Hardie products resist shrinking in the face of temperature changes, including wet, freezing or humid conditions. In fact, all James Hardie siding products are Engineered for Climate®, ready to face the demands of the Midwest’s unique weather. 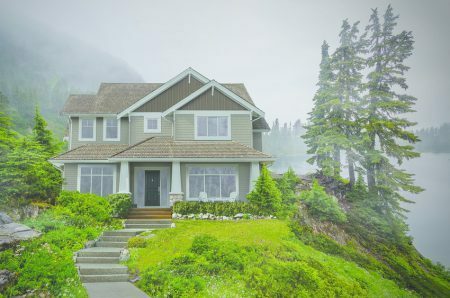 The HardieZone® System entails climate specific product formulations for distinct climate zones, and there’s one brand of siding made especially for the Midwest’s cold and wet climate – James Hardie HZ5® siding. Outperforms the competition. When it comes to long-term, on-the-wall performance, wood-based siding, such as LP® SmartSide® siding, performs like wood. With its many vulnerabilities, wood-based siding simply cannot match the on-the-wall performance of James Hardie fiber cement siding. Wood-based siding and trim is more susceptible to significant moisture movement. In fact, when installing LP SmartSide siding, it requires a 3/16-inch gap between each board to accommodate the moisture movement. Superior strength trim wards off water intrusion. Over time, as rainwater collects on a window sill, it can slowly wear away the paint, allowing water to seep into the wood, and eventually lead to rot. From there, the wood rot can spread up from the sill to the vertical framing pieces and trim. With wood trim, things can get real ugly fast. You can feel secure knowing HardieTrim® boards are made of high-performance fiber cement which will keep its good looks longer than wood trim. Opt to keep your home a safe shield—go with James Hardie siding and trim. When you clad your home in James Hardie building products, your new list of home exterior descriptors include: protected and long lasting.